The objective of this article is to provide our commercial readers with information for cleaning ceramic floors for deep cleaning ceramic floors. Deep cleaning all floors including the cleaning ceramic floors is a periodic or occasional cleaning process and becomes necessary as over time, soil becomes embedded into the floor tile. 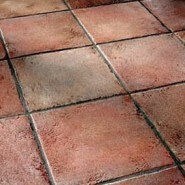 There are many different ways for deep cleaning ceramic floors. This article follows some very simple steps and uses tools and cleaning chemicals that will effectively solve the normally difficult deep cleaning ceramic floors process. This process has been proven in the actual industry ad although like we stated previously, there are many choices but for those on limited budgets and labor, this process does an excellent job and does it inexpensively. The process must be precise and we urge our commercial end-users to follow the steps below to deliver positive results; it requires a total program or process approach including using the proper chemical, dilution, brushes and machines. The deep cleaning process below will outline cleaning a 500 square foot floor using hand-held equipment. For large floor areas an automatic scrubber can be used to save time and labor. Tools & Supplies: Perform heavy or deep cleaning ceramic floors using the following tools and cleaners. In one mop bucket mix a 2 to 1 dilution of Floor Finish Stripper, 2 gallons of water mixed with 1 gallon Floor Finish Stripper in one bucket. Flood mop floor with Stripper Solution (clean approximately 50 square foot section at a time). Work Stripper Solution onto the ceramic floor and using a the single disc floor machine and Scrub Grit brushes, making 3-4 passes in each area is in most cases sufficient. Using wet dry vacuum pick up Stripper Solution. Flood rinse floor with cool clean water from rinse water bucket. Using wet dry vacuum pick up rinse solution. Perform a final damp rinse using a third bucket filled with clear water. Allow floor to thoroughly dry before allowing traffic on the floor.